Amitabh Bachchan, Sudeep, Mahi V Raghav and some other celebs are excited over Ram Gopal Varma aka RGV's acting debut. They say that they will eagerly wait for the release of the movie Cobra. Bollywood megastar Amitabh Bachchan and Kannada actor Sudeep have expressed their happiness over Ram Gopal Varma aka RGV's acting debut, but the director says their words are scaring him beyond his confidence levels. On his 57th birthday, Ram Gopal Varma announced that he would make his acting debut through his next directorial venture Cobra. The filmmakers tweeted on Sunday, "Ahem! On the occasion of my birthday today, i am debuting as an actor for the first time in my career ..I wouldn't mind if u don't bless me .. Thanks." RGV's announcement was a big surprise not just for filmgoers, but many celebs across the country including Amitabh Bachchan and Sudeep. Big B expressed his happiness over this news and said that he finds a competitor in the director. The B-Town star tweeted, "T 3136 - FINALLY.. !! Ram Gopal Varma.. the 'SARKAR' finds his true vocation.. ACTING!! All the best Sircaarrrrr.. DAMN.. another competition !!" Kichcha Sudeep retweeted Amitabh Bachchan's post and revealed his eagerness to watch Cobra. The Kannada actor wrote, "Loved th sweetness of the original sarkar @SrBachchan . This new avatar of urs is an excitement to all those who's worked with u. 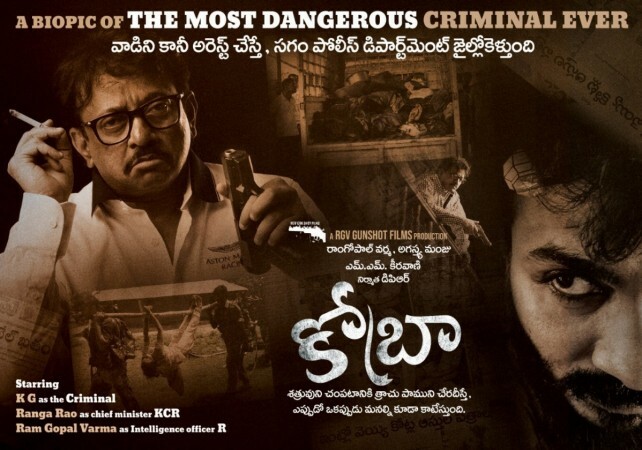 If atall we all watch it together, it's gonna b a bullying time @RGVzoomin sir . Have seen ur passion for films,,my bst wshs to this new u." Ram Gopal Varma has worked with Amitabh Bachchan and Sudeep and he has the utmost respect for both these talented actors. In reply to them, the director tweeted, "Sirrrr u and Amitabh Bachchan saying this is scaring me beyond my confidence levels"
Mahi V Raghav, who is basking in on the success of Yatra, tweeted, "Good luck to @RGVzoomin have no a doubt on his ability to adapt to the new role as an actor. I Call him a monk :) a rare specie who has ability to be detached & who can live in the moment and swing between two extremes." In reply to the Yatra director, Ram Gopal Varma wrote, "Sir ur praise makes me feel dead because only dead people are praised this much but thank u for ur belief on my new #yatra." Cobra is a bilingual movie, which is being made in Hindi and Telugu. Ram Gopal Varma tweeted, "COBRA is a bilingual being made in Hindi and Telugu ..It is a biopic of the most dangerous criminal that ever existed in the criminal history of india ..A new actor K G is playing the protagonist and I am playing an intelligence officer #Cobra." Ram Gopal Varma says that Cobra is a biopic of a rowdy sheeter. He tweeted, "COBRA is a biopic of a rowdy sheeter turned naxalite turned Police covert agent turned gangster ..While the likes of Dawood Ibrahims and Chota Rajans ruled the criminal world on brand names, the Cobra ruled in anonymity ..No one knew of his existence till he died."